DVMagic Studios has announced an update to its popular "ICE Screen HD" iPad 'Lock-Screen' wallpaper creation software. Completely rewritten, this new version has enhanced Photo management capabilities including cropping, resizing, instant special effects, additional fonts and a fantastic new 'in-app' graphical tutorial. This is the last update that will directly support iOS versions prior to 4.3 and is recommended for all users. Easily create personalized "Lock-Screen" wallpapers with your own pictures and information. Commonly used to display Lost/Found contact information as well as ICE (In Case of Emergency) information such as contact, severe allergies and severe medical conditions. The iPad was designed to be used while in both vertical and horizontal positions with ease. Orientation is an important concept to understand when creating wallpapers. Your iPad is rectangular in shape, therefore there are 2 primary directions that your device can display information is Portrait (Vertical) and Landscape (Horizontal). 'Portrait' and 'Landscape' are Photography terms that have come to generally describe Horizontal and Vertical orientations for devices. Displaying a Portrait image on a horizontal device would cause the sides of the photo to be empty. The opposite is true while displaying a Landscape image while device is vertical. The top and bottom would have empty space. To handle this issue, the device automatically zooms into the center of your Lock-Screen image and zooms it in to fill the entire screen. When rotated back to Portrait, it automatically zooms it back out. So it is important to have your photo properly sized (zoomed) to fit the screen so that the iPad can properly display your image in both orientations. Because the top and bottom areas of an image are automatically zoomed when device is horizontal, it is important to keep all of your text message out of the "Image Crop Areas". This is easy to do with the help of on-screen visual guides. Overlay your text message onto your photo or select a color background to create your new wallpaper. Text font, size, color, drop shadow angle(s) and color can be adjusted for the perfect look. Every iPad should have this information in case it is lost/found or for emergency responders to be able to contact your designee! 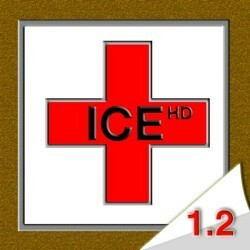 ICE Screen HD 1.29 is $1.99 USD (or equivalent amount in other currencies) and available worldwide exclusively through the App Store in the Utilities category.